The Fryin’ Saucer is the fastest heating, most portable fryer ever developed. Simply unpack it from the included carrying bag, open the legs, attach a 1 pound propane tank, and snap the patented saucer tray into place. Add less than 10 ounces of oil and use the electronic ignition to light the 13,000 BTU Super-Flame adjustable stainless steel burner and you’ll be cooking in no time! It works great with fish, french fries, onion rings, chicken fingers, cheese curds; virtually anything you’d want to fry. Once your food is fried to crispy perfection, slide it out of the reservoir and onto the sloping surface on the sides of the tray. Your food stays pipin’ hot while allowing any excess oil to drain back into the deep fryer well. 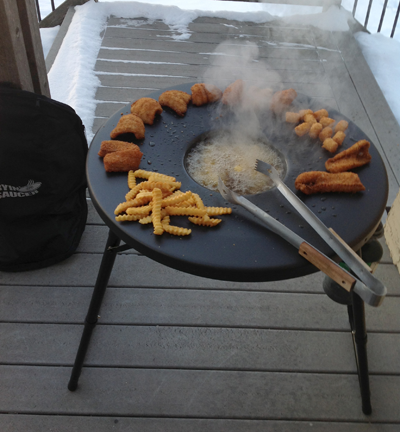 When you’re done fryin’, simply drain your cooking oil into a can or our insulated oil carrier (sold separately), wipe the no-stick saucer surface with a paper towel, and store it back in the carrying case. No greasy mess in your kitchen and no fried fish smell in your house for the next week.